Practice Basic Civil Engineering questions and answers for interviews, campus placements, online tests, aptitude tests, quizzes and competitive exams. This set of Basic Civil Engineering Multiple Choice Questions & Answers (MCQs) focuses on “Weirs”. 1. How many types of weirs are there based on the shape of the crest? Explanation: The four types are sharp-crested, broad-crested, narrow-crested and ogee-shaped weir. 2. _________ weir comprises several designs into one structure. Explanation: Compound weirs are commonly seen in locations where a river has multiple users who may need to bypass the structure. Common design includes a broad-crested weir. Explanation: Triangular weir is shaped like a reverse triangle that is the shape of V. Hence, it is also called V-notch weir. These can be used to measure discharge over small flows with greater accuracy. Explanation: Broad crested weirs are constructed in rectangular shape only and are suitable for larger flows. Hence, head loss is less. Explanation: In trapezoidal weir, the sides are sloping outward at a specific inclination of 1:4 (horizontal: vertical). It is a modification of rectangular weir with slightly higher capacity. Explanation: Discharge or flow rate is measured and calculated by analysing a weir. It is given by Q=CLHn, where C is flow coefficient, L is width of crest, H is height of head, n is different for different structures. 7. ________ is the standard shape of a weir. Explanation: Rectangular is the standard shape of a weir. Triangular and trapezoidal weirs are modifications of it. They are generally suitable for larger flowing channels. Explanation: Cippoletti weir is a special case of a trapezoidal weir. In this, the side slope on either sides are equal. So, trapezoid can be divided into rectangular and triangular portion and hence analysed easily. Explanation: Nappe represents the overflowing sheet of water. If it discharges into air, it is free discharge. If discharge is partly under water, it is submerged/drowned discharge. 10. For a discharge of triangular weirs with notch angle __________ the formula is 0.685 h2.45. Explanation: For 30o angle, the formula is 0.685 h2.45. For 60o angle, it is 1.45 h2.47 and for 90o angle, it is 2.49 h2.48. 11. Which of the below is suitable for soft sandy foundation? Explanation: Masonry or concrete slope weir is the one suitable for soft sandy foundation. It is used where difference in weir crest and downstream river is limited to 3m. 12. Weirs can be used to power water wheels and power sawmills. Explanation: Mill ponds are created by a weir. It impounds water and then it flows over the structure. The energy created by this change in height of the water is used to power watermills and sawmills. 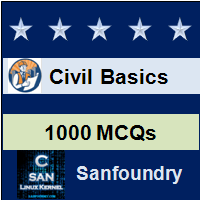 Sanfoundry Global Education & Learning Series – Basic Civil Engineering. To practice all areas of Basic Civil Engineering, here is complete set of 1000+ Multiple Choice Questions and Answers.